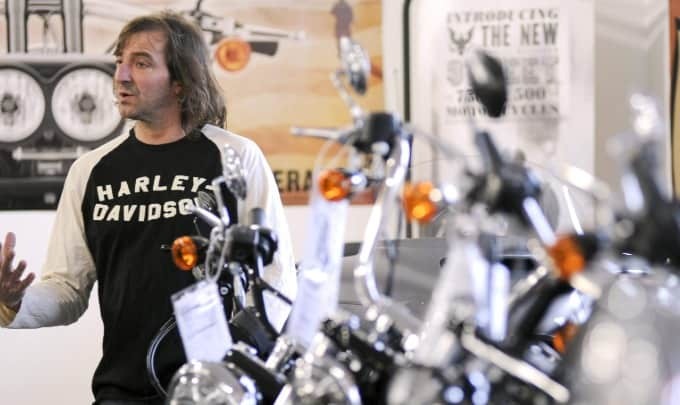 Whatever Happened to Rick Petko from American Chopper? American Chopper was one of the first shows in the reality TV genre. It ran for nine years and followed the mechanics and fabricators of Orange County Choppers, a company that manufactured custom-made motorcycles. After a break of six years, the show started again on the Discovery Channel. However, one of the most popular stars of the first stint of the show, Rick Petko, is not in the show this time around as he no longer works at OCC. This will be disappointing for some fans but he has been keeping busy since the show ended. More details of what he has been up to lately can be found below. His wedding to Brittany Cockeram was featured on American Chopper and since they got married the couple have gone on to have two daughters. His responsibilities as a father is something that he takes very seriously and this is obvious from the things he posts about his daughters on his Instagram account. When he worked for OCC his commuting time was ninety minutes each way and this is a long time to be out of the house when you have a young family which may have contributed to his decision to leave the company. After the main show had ended, the Discovery Channel made a special episode of the show which was named American Chopper: Shaq Bike. Most of the cast from the original series reunited in order to design and make a customized bike for Shaquille O’Neal. The bike that they constructed during this series was the biggest bike that the company had ever made. It was given the nickname Man Of Steel. In 2016 he partnered with the Pocono Mountain Harley-Davidson dealership to start his own fabrication shop from their premises. He approached the owners of the dealership with his idea but was not expecting much as dealerships very rarely have fabrication workshops attached to them. However, the owners, Jim and Linda Schlier, were very excited about the idea of working with him as they knew what a hard worker he was. In a move that took him well away from the world of bikes, he started another business that he runs from home. RPD & Co. allows him to pursue his other passions of knife work, hand forging and metalwork. He is always expanding the range of products that he makes and one of the latest projects that he has taken on is designing custom wedding bands for couples. Although fans do not see him on the TV anymore, there is plenty of opportunity for them to meet him in real life. He travels all over the country for bike shows where he will showcase the latest bike that he is working on. If these shows also include races, he will often participate with the bike he is showing. He posts a lot of pictures on Instagram of these events and this is another way that fans can keep up with what he is currently working on. One of the last TV appearances that he made was on the show Sons Of Speed. This was a show that aired on the Motor Trend network in 2017. It featured Billy Lane and Xavier Murray as they restored old bikes with the intention of entering them into races. Rick is a friend of Billy Lane and work on some of the bikes with the two men. He was glad to be invited onto the show because he has always enjoyed working with old motorcycles. Rick Petko was known as one of the most laid back workers at OCC. He just got on with the job and never got involved with any of the dramas that were taking place between his colleagues. He has said many times that he never set out to be a reality TV star and it is not a career that he wanted to pursue. Even though he is no longer working at OCC fans are hoping that he may one day call in to see his old workmates and they will be able to see him on screen once again.